I think it’s fair to say that “Winter is here,” and with reports of temperatures reaching -15’C this week we are all in need of some hearty, comforting dinners that warm your cockles and provide you with plenty of fuel and goodness to fight off anything this season throws at you (it can also help with the boozy nights and lack of sleep that is Christmas!)! 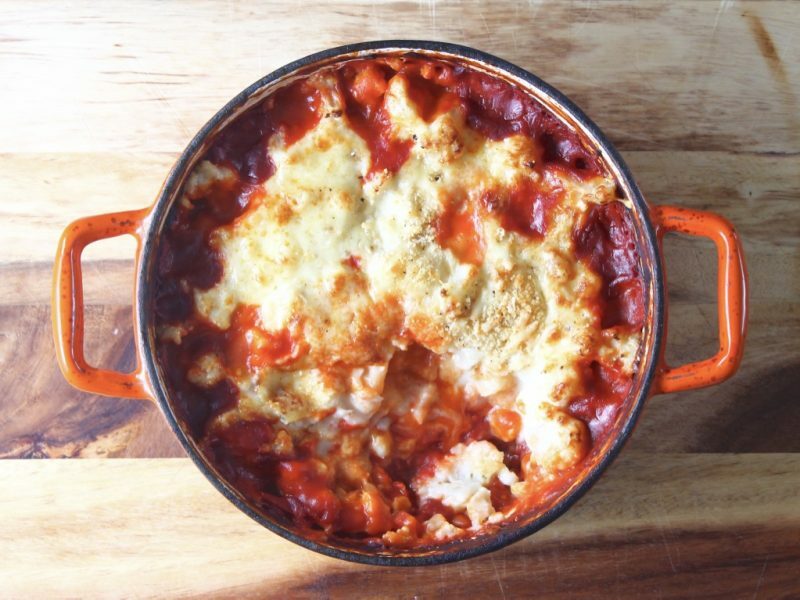 This dish has comfort written all over if… Rich and hearty stew topped with everyone’s favourite – cauliflower cheese. I honestly don’t know why I hadn’t thought of it before!! 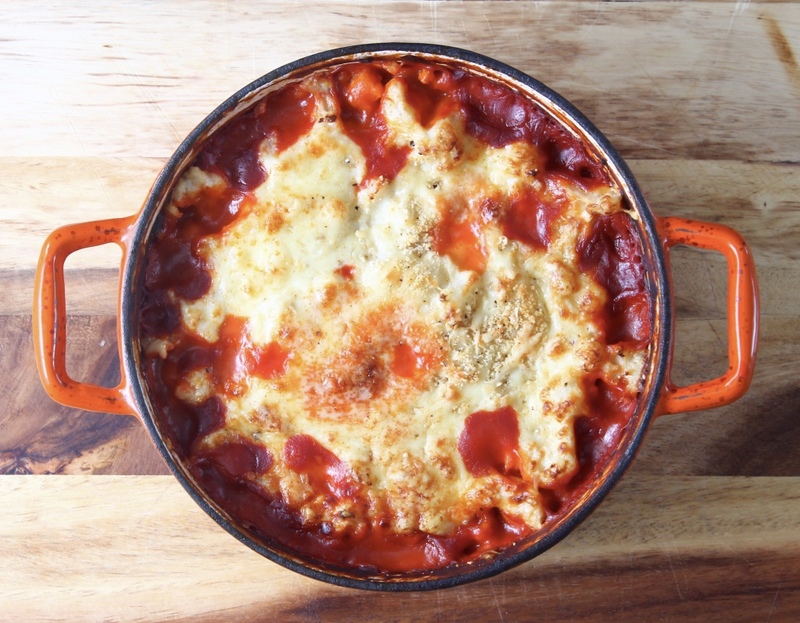 Cauliflower cheese, in my eyes, has become the new mash potato, and pretty often I use it to bulk out pasta bakes as well. Okay, it may not be totally calorie free, but if you make your sauce with strong flavours instead of fat that’s a more positive balance, and any excuse to fill out your 5-a-day (or is it 10 now, I can’t keep up!) is a good enough reason in my book. 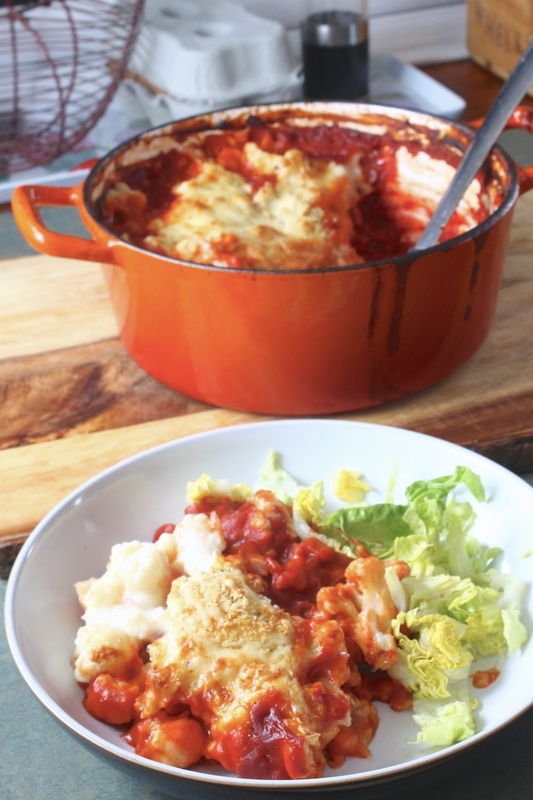 I’m now day dreaming of other recipes I can incorporate cauliflower cheese into…hmmm… watch this space for more on that! In a small-medium size casserole dish, heat the olive oil and fry the onion until soft. Add the remaining vegetables and the garlic and cook for another 10 minutes, stirring regularly so as not to stick to the pan. Pour in the red wine and let it simmer away for 5 minutes to reduce slightly before adding the remaining ingredients. Cover and cook in the oven for 45 minutes to an hour. While your stew is cooking, make your cauliflower cheese by breaking the cauliflower up into small florets and steaming for 8-10 minutes to soften. Make a béchamel sauce by heating the milk until steaming. Mix the flour into a paste with a splash of water and then stir this into your steaming milk along with the stock cube. Continue to stir until the sauce thickens and then turn off the heat and add the mustard and half the cheese. Add the cauliflower to the sauce and squash a little with a masher so it’s well combined. Once the stew is lovely and thick and the veg is soft, top with the cauliflower cheese. Combine the remaining grated cheese with the breadcrumbs and the black pepper and sprinkle on top. Return to the oven, uncovered, for half an hour and then dish up and enjoy with garlic break (or salad if you’re trying to be good). Saw this after dinner….again started feeling hungry….! wow Delicious food blog…. i like very much.Thanks for sharing! Please feel free to visit http://www.ramonascuisine.com/.no for easy and delicious recipes! Скоро мы можем попасть в “рай” – Курс Биткоина должен упасть до 4500-5500 $ – идеальное время для его закупа в 2018 году и разумеется для покупки альткоинов, самым перспективным из которых может стать RIPPLE. Для смещения Bitcoin (BTC) с лидирующей позиции валютой XRP осталось достичь отметки 6.8 USD, что и планируется крупными игроками в январе. Спекулятивные настроения превалируют на рынке криптовалют, но крупные фонды, банки и инвесторы дадут Ripple рост до 100$ уже совсем скоро. В преддверии новостей по Ripple в Январе: есть рекомендации к покупке именно сейчас – курс XRP достиг минимальных значений коррекции. Крупные игроки и трейдеры криптобирж начинают “закуп на низах” в ближайшее время, когда Курс битка упадет до 5000-7000 $.